Hello again, I hope you had as fab a Christmas as I did! For my first Christmas Daddy decided to get as many as my family together as possible, so he invited everyone who could come, to Christmas in a bunkhouse at a Scout Campsite called Leeswood. Sounds cold and wet but it was really cosy and warm once Auntie Eryl had put some homely touches to everything. We had 26 people on one day, it was hectic as I'm only used to having Mum and Dad around, but it was great to meet all my aunts, uncles, cousins and grandparents and spend some time playing with them all. Auntie Claire, Uncle Alec and my cousin Bella could not make it as they are busy making me another cousin (so dad says) but they recorded us all a video message. 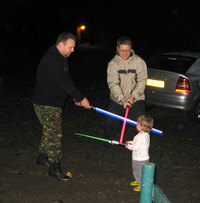 As you can see Dad got a lightsaber for Christmas, what a bunch of geeks my family are! Here take a look at my Dad and Uncle Iain reliving their Childhoods by watching this video. On the normal day to day things as you can see I'm growing fast as ever, but my latest achievement is I've started to eat my first food! Mum has tried baby rice, which is ok, but I haven't liked the other things we have tried so far. I still love standing up so Mum bought me a baby bouncer which I love, its so much fun. Well thats my news for now, have a great 2006!